11th Jan: Passable effort. Gym staff less than pleased. It’s true what they say: You never really appreciate how many nooks and crannies are in the average treadmill until you’ve been forced to clean stuff out of one by a scowling Adonis. 9th Feb: Decorated a fellow parkrunner. Unexpected speedwork session. Who said runners were a friendly laid back bunch??? 16th Feb: Gave up and bought a hankie. If any Hollywood moguls are reading this, I’m willing to negotiate a screen adaptation of the Snot Rocket Diaries. While some might argue it’s more Adrian Mole than Anne Frank, it does feature bogeys, and everyone loves bogeys*. Facto. If you want to learn more about this sort of thing then you can have a look at this instructional video by Mark Remy off of Runners World. Also, you’re a bit weird. * Fun fact: At one point in the mid-eighties, 85% of all British punk bands were called” Snot Rocket”. ** Although some people love them a bit too much. While idly researching the subject online I stumbled across a picture of a charming young lady snot rocketing into her friend’s open mouth from point blank range. There are some things you just can’t un-see. I think we should seal you in perspex as some kind of national treasure. 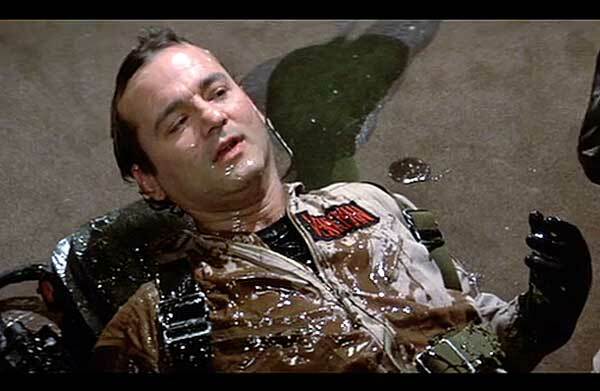 I had to explain the concept of the snot rocket, then the scene from Ghostbusters and finally why I was laughing so hard at some strange man’s ramblings. Must stop reading your blog while I’m eating my tea … you realise that apple sauce is now ruined for me forever?